Wikipedia definition [from Dec 14, 2010]: Zion's Camp was a paramilitary expedition of Latter Day Saints, led by Joseph Smith, Jr., from Kirtland, Ohio to Clay County, Missouri during May and June 1834 in an unsuccessful attempt to regain land from which the Saints had been expelled by non-Mormon settlers. In Latter Day Saint belief, this land had been destined to become a city of Zion, the center of the Millennial kingdom; and Smith dictated a command from God ordering him to lead his church like a modern Moses to redeem Zion "by power, and with a stretched-out arm." The expedition was a failure. The march to Missouri was poorly planned and beset with mishaps, including a near mutiny. Receiving word of the approaching Latter Day Saints, the Missourians formed their own militias, which outnumbered Smith's men. Smith then dictated another revelation stating that the church was presently unworthy to "redeem Zion" because of its lack of commitment to the United Order, a form of religious communism, and must "wait a little season" until its elders could receive their promised endowment of heavenly power. The expedition was disbanded on July 25, 1834, during a cholera epidemic, and a majority of survivors returned to Ohio. Nevertheless, the failed expedition permitted Smith to determine his most loyal followers, and many of these men were thereafter given positions of religious leadership. A fundamental tenet of Latter Day Saint theology is that the biblical New Jerusalem will be built in the Americas, a belief established by 1829 and included in the Book of Mormon, a scripture of the religion. On July 20, 1831, Joseph Smith, Jr. identified the location of this New Jerusalem as Jackson County, Missouri and began sending Latter Day Saint settlers there to establish a City of Zion, which was to be a Latter Day Saint millennial kingdom. By the summer of 1833, there were about 1200 Latter Day Saints in Jackson County, and older settlers felt threatened by their political and economic power, a fear exacerbated by rumors that Latter Day Saints favored abolitionism. Forming militia groups, the "old settlers" as they were called, organized attacks against the Latter Day Saints during the summer of 1833. A revelation dictated by Joseph Smith in August 1833 discouraged immediate retaliation but permitted Latter Day Saints to retaliate after the fourth act of aggression and "unto the third and fourth generation." The Saints initially attempted to regain their lands through political and legal means, enlisting four Missouri attorneys to communicate with the court and the Missouri government. This decision to engage lawyers and fight the issue in court likely sparked further violence in late October 1833. When the Missourians attacked the Saints the fourth time, they fought back as allowed by Smith's revelation. By the end of 1833, Latter Day Saint homes, as well as the church print shop, had been destroyed, and nearly all church members had fled the county. Mormon refugees settled temporarily in neighboring counties, including Clay County to the north, across the Missouri River from Jackson County. In December 1833, Smith dictated another revelation about the "redemption of Zion." It commanded Missouri settlers to seek redress through the courts or the political process but warned that a military solution would become necessary should those efforts fail. The revelation predicted that God would soon command Smith to gather warriors of the church to "get ye straightway unto my land; break down the walls of mine enemies; throw down their tower, and scatter their watchmen." Further, should the Missourians oppose the Saints, the latter would "avenge me of mine enemies, that by and by I may come with the residue of mine house and possess the land." The legal and political efforts appeared futile, although after the security of a February 24, 1834 court hearing was threatened by Missourian protesters, it was postponed until late 1834. At the time, the headquarters of the Latter Day Saint church was in Kirtland, Ohio. In 1834, Joseph Smith said he received a revelation from God, calling for a militia to be raised in Kirtland which would then march to Missouri and "redeem Zion." About 200 men and a number of women and children volunteered to join this militia which became known as "Zion's Camp." Smith and his volunteers left Kirtland on May 4, 1834. By June 4, they had marched across Indiana and Illinois, reaching the Mississippi River, which they crossed, entering Missouri. They crossed most of the state by the end of June, and news of their approach caused some alarm among non-Mormons in Jackson and Clay Counties. Attempts to negotiate a return of the Latter Day Saints to Jackson County proved fruitless, but Smith decided to disband Zion's Camp rather than attempt to "redeem Zion" by force. Many members of the camp believed they should fight to redeem Zion and criticized Smith. Much of the camp subsequently became ill with cholera. The two-thousand-mile march failed in all its objectives. Fourteen participants died. Smith encountered increased hostility when he returned to Kirtland. Nevertheless, many of the participants in Zion's Camp became committed loyalists to the movement. When Smith returned to Kirtland, he organized the Quorum of the Twelve Apostles and the First Quorum of the Seventy, choosing primarily men who had served in Zion's Camp. 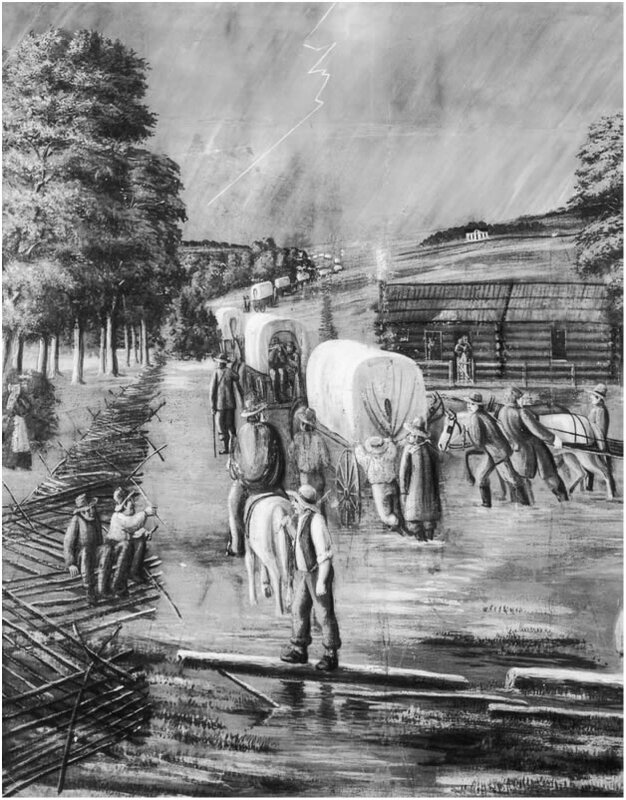 The Latter Day Saints failed to achieve their goal of returning to Jackson County, and although the Missouri legislature approved a compromise which set aside the new Caldwell County specifically for their settlement in 1836, two years later, Missourians drove the Mormons across the Mississippi into Illinois. Long after Smith's death, members of what is now known as the Church of Christ (Temple Lot) became the first members of the Latter Day Saint movement to return to Jackson County in an attempt to redeem Zion. 1834— Illinois River, Illinois. While the Zion's Camp marchers were encamped on the banks of the Illinois River, Joseph Smith visited a burial mound and examined a skeleton. He identified the man as a warrior who had been called Zelph. To read more on the very fascinating discovery of Zelph, the White Lamanite. When the story of Zion's Camp is taught in church, it is almost always taught as a faith-promoting event. Little is mentioned of the military failure. Instead, it is generally taught as an exercise that increased the faith of the members who went on the Zion's Camp journey. Much is made of the fact that many of the church's leaders came from those that attended Zion's Camp and that it was a success in that regard. It is almost never mentioned that 14 Latter-day Saints got sick and died during the Zion's Camp expedition. Those men died of cholera that they received during the harsh conditions of the expedition. These faithful Latter-day Saints would not have died if it wasn't for Zion's Camp. It is doubtful that the widows and orphans left behind from those 14 men considered Zion's Camp a success.